Everyone in the workplace is motivated by something. This motivation could be external in nature, such a money, and status, or internal, such as a desire to do a good job. Leaders and managers have sought to understand theories of motivation and then test them in the workplace to increase the productivity and effectiveness of their workforce. Adam’s Equity Theory, also known as the Equity Theory of Motivation, was developed in 1963 by John Stacey Adams, a workplace behavioral psychologist. Equity Theory is based on the idea that individuals are motivated by fairness. In simple terms, equity theory states that if an individual identifies an inequity between themselves and a peer, they will adjust the work they do to make the situation fair in their eyes. As an example of equity theory, if an employee learns that a peer doing exactly the same job as them is earning more money, then they may choose to do less work, thus creating fairness in their eyes. Extrapolating from this, Adam’s Equity Theory tells us that the higher an individual’s perception of equity (fairness), then the more motivated they will be. Conversely, an individual will be demotivated if they perceive unfairness. 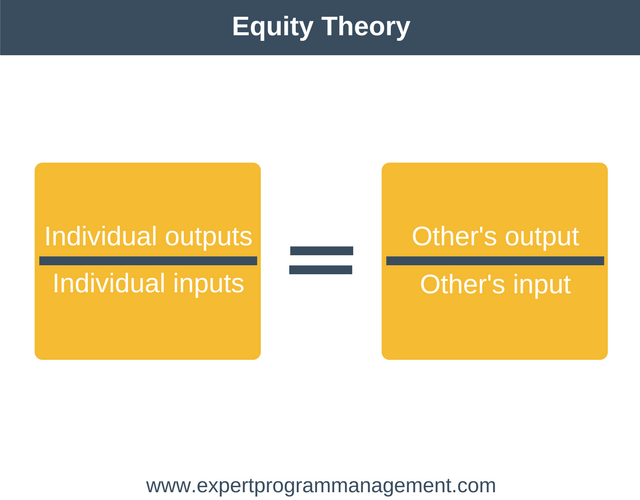 To understand Adam’s Equity Theory in full, we need to first define inputs and outputs. Inputs are defined as those things that an individual does in order to receive an output. They are the contribution the individual makes to the organization. The number of hours worked (effort). The experience brought to the role. The responsibilities and duties of the individual in the role. The loyalty the individual has demonstrated to superiors or the organization. The flexibility shown by the individual, for example, by accepting assignments at very short notice or with very tight deadlines. Outputs (sometimes referred to as outcomes) are the result an individual receives as a result of their inputs to the organization. Some of these benefits will be tangible, such as salary, but others will be intangible, such as recognition. Now that we understand inputs and outputs, we’re in a position to define equity. Equity is defined as an individual’s outputs divided by that same person’s inputs. Adam’s Equity Theory goes a step further and states that individuals don’t just understand equity in isolation, instead they look around and compare themselves to others. If they perceive an inequity then they will adjust their inputs to restore balance. This is illustrated in the following equity theory equation. Self-inside: the individual’s experience within their current organization. Self-outside: the individual’s experience with other organizations. Others-inside: others within the individual’s current organization. Others-outside: others outside of the individual organization. For example, if a programmer compares what they earn to other programmers within the same organization then the referent group is the others-inside. If they compare themselves to programmers they know socially then the referent group is others-outside. If they were to compare themselves to what they earnt in their previous job then the referent group is self-outside. Adam’s Equity Theory still holds even when people compare themselves to others doing very different roles and earning very different compensation. Take our example of a programmer again. They may compare themselves to the CEO of their company who earns 100 times more than the programmer. How can this seem fair? Well, the answer is that they will perceive the inputs to be vastly different. They will see that they have a great work-life balance whereas the CEO is traveling a lot of the time. They may perceive that the CEO has vastly more experience, alongside working much longer hours and having to deal with more stress. In this way, fairness is established in the mind of the individual. 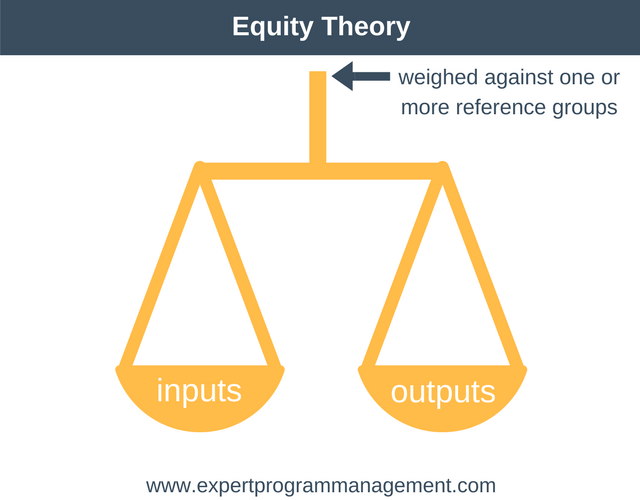 It is always worth remembering that Equity Theory applies in a very broad sense. Each person will respond to perceived inequality in their own individual and unique way. As you can see, in each of these examples someone is comparing their own compensation and effort against someone else’s. Although comparing compensation is the most common comparator, other typical forms of comparison include comparing learning opportunities or comparing opportunities to work from home. People measure the total of all inputs against the total of all outputs. This could mean that a person with children may accept flexible working hours in return for lower pay. Unfortunately, an individual’s values will be used when they measure fairness. So two identical employees on identical pay may each see the fairness of their situation differently. Perceptions may also be different from one person to another. The art of being a good manager is to manage these expectations and influence values. Although it is understandable that more senior staff earn significantly more, there are limits, and excessive pay for senior people can be demotivating. An employee who believes they are overcompensated may increase their effort. Change an individual’s inputs or outputs. In essence, the Equity Theory of Motivation proposes that high levels of employee motivation in the workplace can only be achieved when each employee perceives their treatment to be fair relative to others. Employees will compare themselves to other groups both inside and outside of the organization. In doing so, they will compare the total of all inputs against the total of all outputs. If they perceive unfairness they will adjust their inputs to compensate, working more or working less, depending on if their situation is positive or negative relative to the group or person being compared. Recognising the phrases employees use when equity theory is in play in the workplace can be a key step in creating a high-performance team.